Join the discussion on our forums! 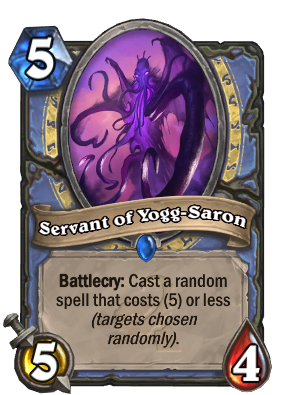 Come discuss Servant of Yogg-Saron over in our dedicated Servant of Yogg-Saron discussion topic. Battlecry: Cast a random spell that costs (5) or less (targets chosen randomly). Yogg-Saron always likes to complain about how he has too many servants and there are too many mouths to feed. It's garbage. But it's also a hell of a lot of fun. 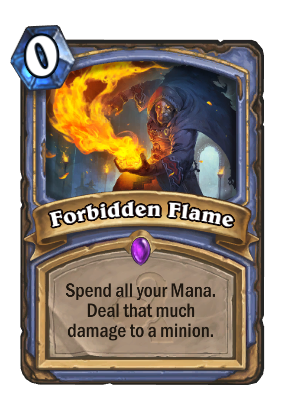 Does this card count for the mage quest? I'm pretty sure that the spells must be cast as a card from your hand, not via battlecry. I played this against a priest. He had managed to get me to 2 health, however he was topdecking. He did have burst and damage cards in his deck(holy nova and mind blast) and i knew he could draw lethal any moment. As my last hope i played servant of yogg-saron, figuring i might as well go out in style. His spell was burgle which got me lightwell. My greatest comeback of all my games. i made an account to say that my opponent played this card in arena, which cast mindgames, which pulled ysera from my deck. i did the math, it's about a 0.009% chance of happening. anyway, have a nice day. I played it on constructed and got a mind games which pulled a deathwing... mostly tho he kills himself. Such an absolute coin-flip card. I completely avoid this and Spellslinger in Arena. Having him casting Astral Communion on 10 mana with full hand is the most priceless thing i've ever saw in HS. Why thank you Servant of Yogg-Saron for casting Naturalize on yourself.